D. carduchorum Chowdhuri & Davis in Notes R.B.G. Edinb. 22: 407 (1958). Slender perennial, 25-60 cm. Stem angled and ± sulcate, crisply puberulent below or eventually glabrescent, usually viscid-pubescent above. Median cauline leaves few, slenderly petiolate or the uppermost subsessile, glabrescent, palma- tisect, segments deeply divided into numerous linear-lanceolate laciniae. Raceme lax or rather dense, oblong-linear, 2.5-3.5 mm broad. Lower bracts trisect or sometimes linear like the upper ones, adpressed pubescent; bracteoles borne near top of pedicels, linear-lanceolate. 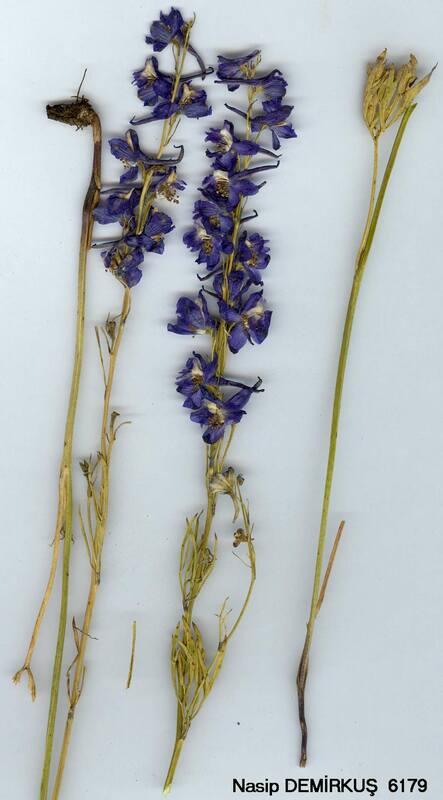 Flowers bright blue or violet-blue, 20-30 mm, sepals adpressed-pubescent outside; petals shortly bifid. Follicles hirsute-pubescent. Fl. 7-8. Rocky slopes, often above streams and usually on limestone, 2250-2850 m.
Type: [Turkey C9] Hakkari: Cilo Dağ, above Diz deresi, 2400 m, 7 viii 1954, Davis & O. Polunin (D. 23954, holo. E! iso K!). Kurdistan. B9 Van: d. Hoşap, Kepir Da., 2600 m, D. 23325! C9 Hakkari: Kara Da., 2700 m, D. 24370! Endemic; Ir.-Tur. element. Allied to D. micranthum Boiss. 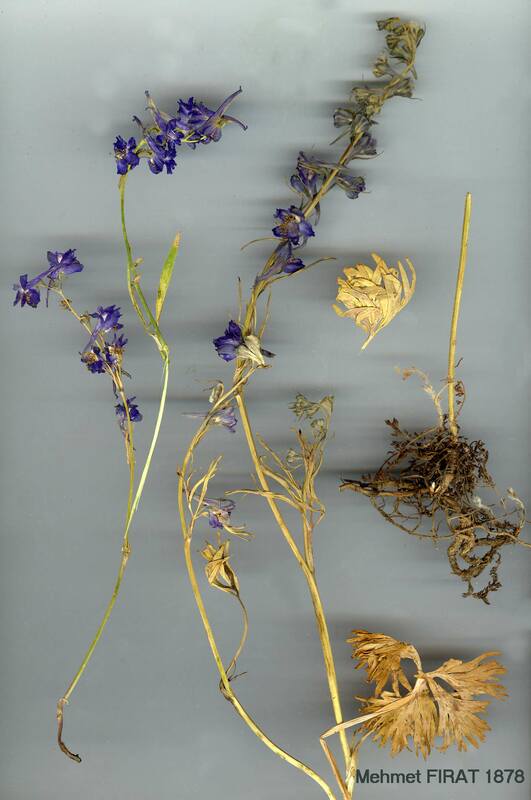 from N. Iraq (wrongly recorded from Turkish Kurdistan by Nábelek), which differs in its more paniculate inflorescence with crisped pubescence, laxer racemes with spreading (not erect) pedicels, and shorter bracts and bracteoles. Two gatherings of D. carduchorum from Van (Pelli Da., D. 22593! Kavuşşahap Da., D. 23061!) have crisped indumentum in the region of the raceme, and D. 22593 also has exceptionally long bracts and bracteoles - variations that are in the direction of D. dolichostachyum.